After eight entertainingly laid-back mysteries starring Elvis Cole (L.A. Requiem, 1999, etc. 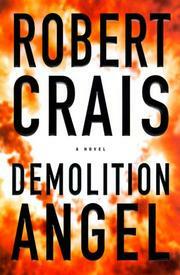 ), Crais tightens the screws to the max in this white-hot crossover thriller about a cop on the trail of a serial bomber. Three years ago, Carol Starkey was abruptly retired from the LAPD’s Bomb Squad by an explosive that killed both her and her supervisor/lover. She was brought back to life after two minutes of flatlining; he wasn’t. Now that she’s working at Criminal Conspiracy, she’s the obvious choice to head the investigation when a bomb kills her old colleague Charlie Riggio. And even though her own ordeal left her dead in more ways than one, she’s a terrific choice, too, because right from the start she makes things happen. She realizes that the bomb must have been detonated by remote control, and that the killer must therefore have been on the scene. When ATF agent Jack Pell links the murder to half a dozen earlier bombings-for-hire and assassinations of explosives experts, she joins forces with Pell in an uneasy romance that keeps the case in the LAPD corral. And, inevitably, she finds herself online with Mr. Red, the gleefully self-advertising bomber obsessed with making the FBI’s Ten Most Wanted list (and evidently imitating his fictional model Hannibal Lecter). But not all Starkey’s calls turn out golden, and one of them sparks a shocking plot twist that brings the globe-hopping Mr. Red, who’d been perfectly happy killing people in faraway jurisdictions, back to the City of Angels. Soon enough, Starkey’s been frozen out of the case, forced to go up against Mr. Red with only Pell for backup. Crais spikes this predictable, foolproof yarn with so many surprises and such a masterly command of pace that you’ll find yourself checking the clock every ten pages. Make sure it’s not digital.